While earliest European immigrants in Door County survived by subsistence farming, efforts in later years to grow cash crops proved challenging, due in large part to the area’s rocky landscape. Despite little success with traditional crops, efforts continued to find a crop that could grow in shallow, rocky soil. Newly planted trees at the Fardig Orchard in Ephraim, WI, c. 1930. Photo courtesy of the Ephraim Historical Foundation. The answer would come in the 1860s, with the unexpected success of fruit orchards. A Swiss immigrant named Joseph Zettel, who settled in Door County in 1855, discovered that apple trees prospered in the area. Door County’s temperate climate and the unlikelihood of late frosts due to the lake effect from Green Bay and Lake Michigan, led to plentiful apple crops. Additionally, the shallow soil depth of only a few feet on top of bedrock provided ideal drainage, inhibiting the likelihood of root rot. By the 1890s, Zettel had forty-five acres of apple trees planted, and his farm produced 3,000 bushels of apples per year. Packing cherries for shipment in 1924. Image courtesy of the Wisconsin Historical Society. Image ID: 93324. Zettel’s success attracted the attention of A.L. Hatch, a fruit grower from southern Wisconsin, and University of Wisconsin horticulture professor E.S. Goff. In 1891, the pair purchased eighty acres of land and began experimenting with different types of fruit crops, including plums, strawberries, raspberries, and cherries. It was this last crop that would prove especially adept at growing in Door County. John Fridlund sets the dynamite for a new cherry tree planting at the Fardig Orchard in Ephraim, WI, c. 1930. Photo courtesy of the Ephraim Historical Foundation. Seeing Hatch and Goff’s success, local growers began planting small cherry orchards during the 1890s. The rocky soil, though beneficial for the growth of trees, proved challenging in the planting process, and dynamite was often employed to break up the ground. Despite the challenges, the success of cherry orchards led to thousands of new trees being planted each year, and by 1910, Door County cherry industry received national attention. 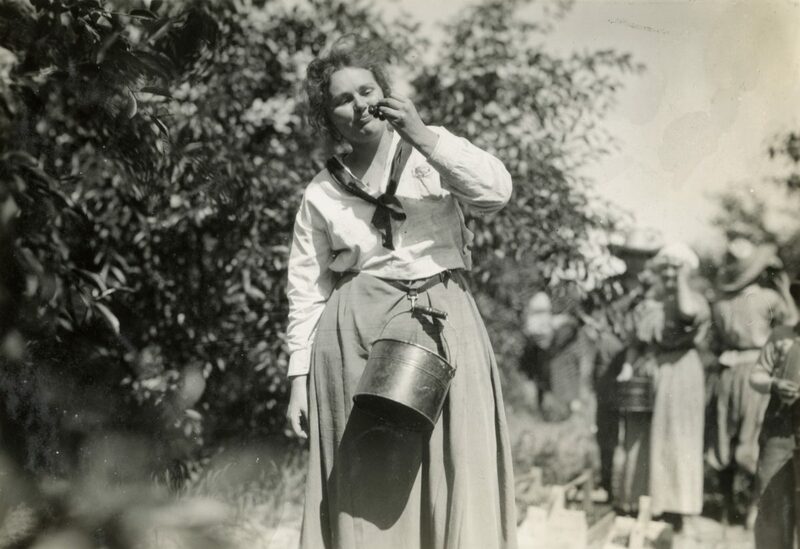 While early orchards sold cherries at roadside stands or gave visitors the opportunity to “pick your own,” the popularity of Door County cherries continued to increase, leading to large-scale commercial canning. Image courtesy of the Wisconsin Historical Society. Image ID: 93442. The peak of the cherry industry in Door County came in the 1950s, with 700 cherry growers producing up to 50 million pounds of cherries annually. Though early growers experimented with different cherry varieties, they found greatest success with the tart Montmorency variety. Today, the Montmorency cherries grown in Door County account for 95% of all tart cherries grown in Wisconsin, and while demand has lessened since the 1950s, approximately 7 million pounds of cherries are still produced annually. F. Cranefield, Editor, Annual Report of the Wisconsin State Horticultural Society for the year 1915, (Madison, WI: Cantwell Printing Company, 1915), 83. Wisconsin Hometown Stories: Door County, Joseph Zettel. http://wpt.org/Wisconsin-Hometown-Stories/207077/Asset/zettel-joseph. Hjalmar Rued Holand, History of Door County, Wisconsin, the County Beautiful Volume 1, (Chicago: The S.J. Clarke Publishing Company, 1917), 161. Wisconsin Ag in the Classroom, Cherries. https://wisagclassroom.org/wp-content/uploads/2011/09/Cherry-Plans.pdf. Featured image: Image courtesy of the Wisconsin Historical Society. Image ID: 48771.